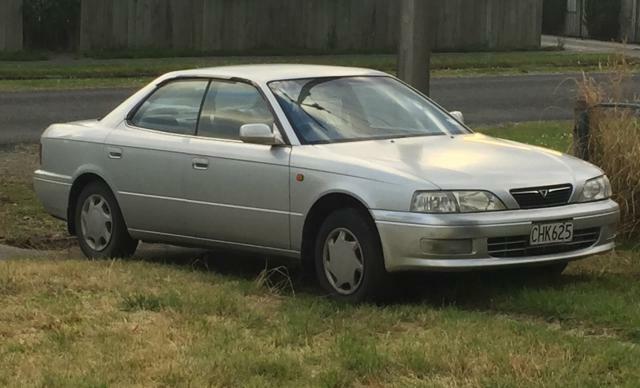 Police are seeking sightings of a vehicle believed to be connected to an altercation which left a man with serious head injuries in Invercargill yesterday, but say there was no shooting. Around 3.30pm police attended an address in Drury Lane, Grasmere where a 26-year-old man had suffered serious head injuries. He was taken to Southland Hospital, where he remains in a serious but stable condition. A police spokeswoman said they were still determining the cause of the victim’s injuries, but it did not appear he had been shot. A vehicle believed to be involved was seized by police last night in Mataura. It is a 1994 Toyota Etoile, registration CHK625, pictured here. "Police would like to hear from any members of the public who saw this vehicle either before or after this incident occurred." Anyone with information should contact Invercargill police station on (03) 211 0400, or Crimestoppers anonymously on 0800 555 111. Forensic investigators could be seen on Sunday coming and going in and out of the house at Drury Lane. When the Otago Daily Times reporter arrived at the scene, one investigator was examining the green and white letter box. A local resident Ramu McCallum said a police car had been posted outside the house all night. Stuff reported that police, including dog units, were seen in Mataura last night, and a police spokeswoman told the Otago Daily Times this morning no arrest had been made. Until this afternoon police confirmed few details about the incident, beyond saying there was an altercation in Drury Lane, Grasmere, that was "firearm related". Numerous residents spoken to by an Otago Daily Times reporter said they had heard a man had been shot in the head, though police now say these reports were incorrect. Detective Senior Sergeant Stuart Harvey said yesterday police were searching for an individual involved in the incident. Earlier yesterday afternoon police, including the armed offenders squad, swarmed to the Invercargill suburb of Grasmere. Heavily armed police officers cordoned off both sides of Drury Lane between Haywood Street and Bay Road, stopping bystanders and even residents from entering. St John Ambulance said one person was injured in the incident and was rushed to Invercargill Hospital in a critical condition. Ramu McCallum, who was returning from work was one of those stopped from entering the road. "I didn’t expect to come home to this. It’s pretty crazy." Damian Duffy, a resident who lives on Drury Lane, opposite the cordoned off section, said he was about to leave for work when he saw the police cars converging on the scene down the road. He said the first police vehicles he saw arriving at scene did not use their sirens. "An ambulance showed up and it was there for five to 10 minutes." He had heard a Mongrel Mob member had been shot. "It’s usually a very quiet neighbourhood," said his partner, who did not want to be named. As the Otago Daily Times reporter was speaking to Mr Duffy a police car pulled up with the police officer urging them to get into their house "in case anything else happens"..